Navasota, TX is located about 20 miles from College Station and an hour away from Houston. It's a tiny town with old Texas charm and filled with historic buildings. It's one of those stops that's worth a few minutes just to stroll around their downtown. I've posted a few times before here and here using it as backgrounds for style posts, but today I thought I'd highlight a few places you can visit if you are looking for something "Spring-like" to do. If you want a few other small town recommendations you can check out the Small Town Charm page for unique stops found countryside. First things first, I recommend staying at The Red Velvet Inn (see this post). It's a pet friendly bed and breakfast located less than 5 minutes from downtown. It's painted the brightest shade of red and has a lovely front porch with rocking chairs. If you are looking to grab a bite to eat, Erick's Mexican Restaurant is authentic Tex-Mex. Fajitas are a staple here in Texas and usually my go-to when ordering Mexican food. For coffee picks, try Classic Rock Company Coffee House or Java Hot Spot. One of the best places to eat is right off Highway 6 and is centered in a Garden. M Cafe has the yummiest sandwiches, salads, and a sunny little tea room with traditional teas served in the sweetest teapots. They also have a wicked array of desserts! They close early in the afternoon on the weekends, so make sure you go by before 4pm. You can read more about them here and here in previous posts. Downtown is filled with several sites to see, these photographs were taken outside of the Historic Wood Factory, but downtown boasts of an old movie theater (still operating) and has several places to shop, eat and just perfect to walk around. Many of the buildings are painted different shades of pastel and it's great if you are looking for antiques. If you are visiting in late March/early April it's one of the best spots for sightseeing the famous Texas bluebonnet in beautiful fields of indigo blue. There's not much prettier than seeing a blanket of these blue babies. I wore this yellow dress which has a sway to it when you walk. I liked it so much I ended up ordering one in white, too (which I plan on wearing to the Greek Festival in two weeks). The dress has a lovely wrapped waist and lightweight chiffon that blows in the wind. I paired it with light blue ballet flats and a blue vegan leather cross body purse. I've been really digging this midi length which is great for this time of year with warmer days and cooler nights. 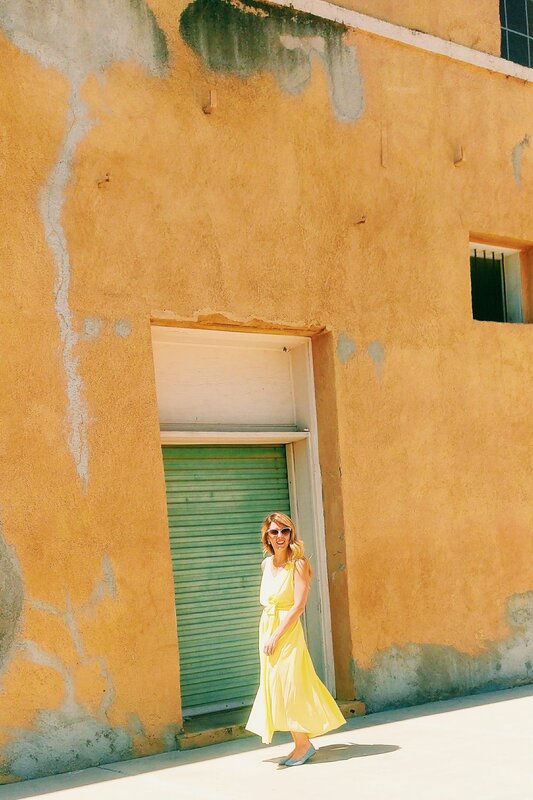 I found a few more sweet yellow dresses with similar fabric if you want to shop the post below.